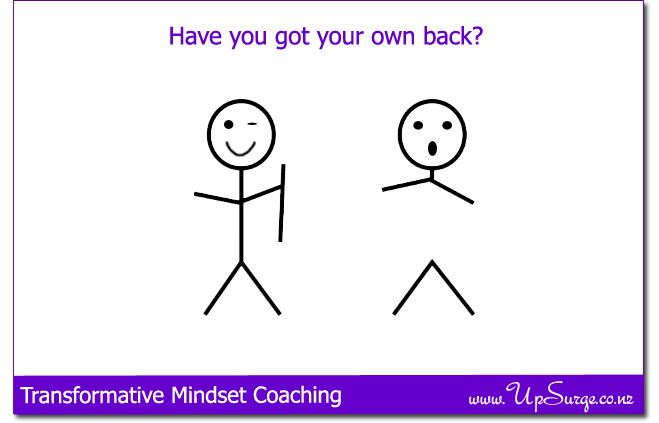 Have you got your own back? These are all lovely words, but what would we do/think/say/feel if we were to treat ourselves with kindness, loyalty, honesty and compassion? Now that is a ‘how long is a piece of string’ kinda question… We are all so beautifully unique but I feel there is some common ground. Let’s start with allowing our feelings to be whatever they are without trying to change, deny or invalidate them. If we feel sad, excited, angry, calm, frightened etc then you don’t need to hold them up to a firing squad and question if we are entitled to feel that way – a classic is to tell yourself you don’t have a right to be unhappy because you live in a warm house in a safe country and have enough food to eat which is more than most of the people in the world…So would you like some guilt to go with that unhappiness or maybe a sprinkling of shame? If you are feeling unhappy then channel your inner Beatles and ‘let it be’. A friend wouldn’t say ‘You’re not allowed to feel [fill in the blank]’? Same goes for excited and happy – sometimes we can feel very uneasy when we are happy in a ‘this won’t last, I’m inviting disaster being this happy’ kind of way. Picture yourself on the balcony of a skyscraper called ‘Happiness’ (maybe not if you get vertigo) – if you only go to 3rd floor it’s a shorter fall than if you go to the 26th floor – but hey, what a view from the 26th floor of happiness! There is a theory that being happy tops up our resilience for more trying times – so gorge yourself on this good stuff. Our inner voices (believe me, most people have more than one inner voice and they really know how to argue with each other…) are our sound track of life. Sometimes we can speak to ourselves in the cruellest and most uncompassionate of ways – ways in which we certainly wouldn’t speak to our best friend – well not if we wanted to continue the friendship. If you metaphorically fell flat on your face would a friend say ‘you are so uncoordinated, you always fall over, stop making a fool of yourself’? Emm, doesn’t sound like page 1 of the Supportive Friend Manual to me but our self-talk can really go for the jugular. Any chance these voices could be from our childhood and we just keep playing the tape over and over? If so, push rewind and tape something much kinder over the top. Actions, behaviours, habits – do they honour the precious, gifted individual that you are or do they imply that you are somehow ‘broken’? An interesting vantage point on our self-love is through the lens of our health. The old quip ‘treat your body like a temple, not a ruin’ is good in theory but we can have some pretty self-destructive habits around not meeting our physical needs for sleep, nutritious food, exercise etc. If we are being our own best friend nurturing ourselves would be the natural choice. Are you an innie or an exxie? I am not talking about belly buttons but personality types – an introvert recharges in private whereas an extrovert gets their energy from spending time with others. Do you know where you fall on the intro/extro continuum? A good friend makes sure you get the soul sustenance you need. Lastly, let’s get honest about honesty. We can be masters at pleasing others but if this is continuously at the expense of pleasing yourself then you are not being honest with yourself or others – you are selling out big time. Imagine your partner always insisted on sushi and you hated the stuff but to keep the peace you always sucked it up and never stood up for curry (spot the food theme today). You may as well send your self-worth a telegram saying “my needs aren’t important” – you would never want a friend to feel like that would you? I invite you to become a compassionate observer of your inner voice, habits and how you treat your feelings. Would you want to be friends with someone who treated you like that? If not, best you sit down and have a heart to heart with yourself – you need a friend on the inside. Also remember, as the quote above says, you can only be as good a friend to others as you are to yourself.